This is a Post from the Symbol Surfing Blog from Thu, Aug 23, 2018. 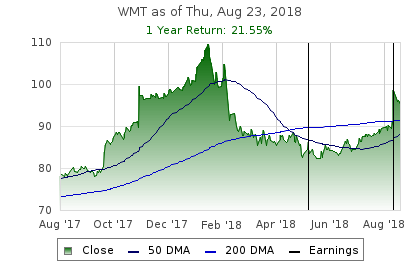 As my fellow Symbol Surfers know, I bought WMT on Wed, May 16, 2018. Since then, the stock continued to grind higher then Wal-mart crushed their earnings announcement. It's been a few days since and I haven't seen any follow through since the big move which is kinda normal. I am selling because I want to lock in my profits before the stock price drifts any lower. "Many investors make the mistake of buying high and selling low while the exact opposite is the right strategy to outperform over the long term." Check out other investing quotes that will help improve your performance. Just because I sold today, does not mean I am going to forget about this stock. I scan the Dow 30 stocks daily looking for trading opportunities. If or when there is a decent pullback, maybe to $90, I would like to get back in especially with the holidays coming up soon. I bought a lot of stuff from Wal-Mart recently and just got my $22.40 Big Fat Check from Ebates. By the way, if you are not using Ebates yet on all your online purchases, you are literally leaving money on the table. Sign up with my ebates affilaite link today and you'll get a $10 bonus check after your first purchase. Right now get up to 10.0% cash back at Wal-Mart. << Do You Agree With Any Of These 10 Experts?